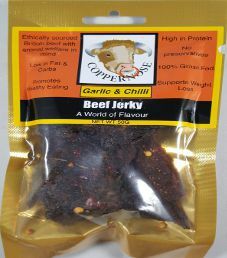 The next review for CopperNose will focus on a 1.8 ounce/50 gram bag of their spicy flavored 100% grass-fed beef jerky. 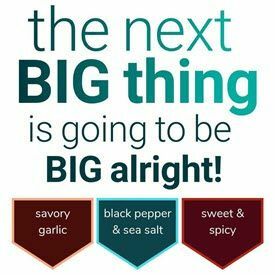 This flavor is described as being started by Agnes Coppernose in 1666, where a baker on Pudding Lane complained it was more mild than spicy. Outraged, Agnes prepared the strongest dish that she could, which in turn was so hot, it burned the wood house down. This bag was graciously submitted for review by one of the co-owners, Daniel Derry. 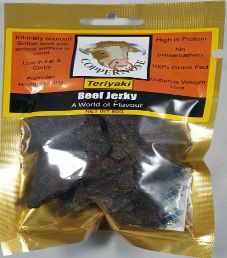 The next review for CopperNose will be on a 1.8 ounce/50 gram bag of their smokey flavored 100% grass-fed beef jerky. This flavor is described as a comfort food for Jack Coppernose in the 18th century while distilling moonshine. The bag was graciously submitted for review by one of the co-owners, Daniel Derry. 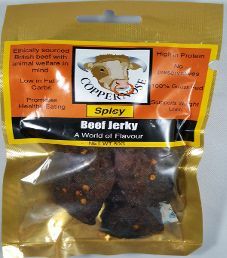 The first review for CopperNose will be on a 1.8 ounce/50 gram bag of their garlic & chilli flavored 100% grass-fed beef jerky. 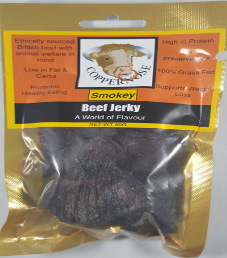 The bag was kindly submitted for review by one of the co-owners, Daniel Derry.